That was in 1795. By 1803, the trustees had collected enough money to construct a frame building at the corner of Bay and Church streets. Two years later, Beaufort College opened. Unfortunately enrollment never met expectations, partly due to the popularity of South Carolina College (now the University of South Carolina), which was established in Columbia in 1801. Beaufort College subsequently became a preparatory school, and many of its graduates went on South Carolina College as well as renowned northern schools such as Harvard, Yale, and Princeton. Despite its new purpose, the school retained its original name – Beaufort College. An outbreak of yellow fever caused Beaufort College to close in 1817, and its original building was razed. The school reopened in a new location at Newcastle and Craven streets in 1820 and flourished until the start of the Civil War. During this antebellum period, the above building was constructed on Carteret Street. It served the school from 1852 to 1861. During the war, the structure was used as a hospital by Union troops. Afterwards, the Federal government used Beaufort College as the local headquarters for the Freedmen’s Bureau, which provided education, food, and health care to former slaves. The building functioned in this capacity until 1872. From 1909 until 1959 it was used as an elementary school. In 1959 the University of South Carolina wished to expand its program to the Beaufort area and opened a two-year branch in the former Beaufort College building. 57 students enrolled in the initial class. The University of South Carolina-Beaufort proved popular, and the school acquired more property and added other buildings over the years. In 1985 the college opened a branch on Hilton Head Island, and in 2004 it became an accredited four-year university. Beaufort is significant for its role as a major center of South Carolina’s antebellum plantation culture, its contribution to the history of the Civil War, and for its role it played in African-American history both during and after the war. Architecturally, the district is significant both for the high-style architecture produced by its pre-war planters and for the folk architectural patterns of its post-war African-American community. 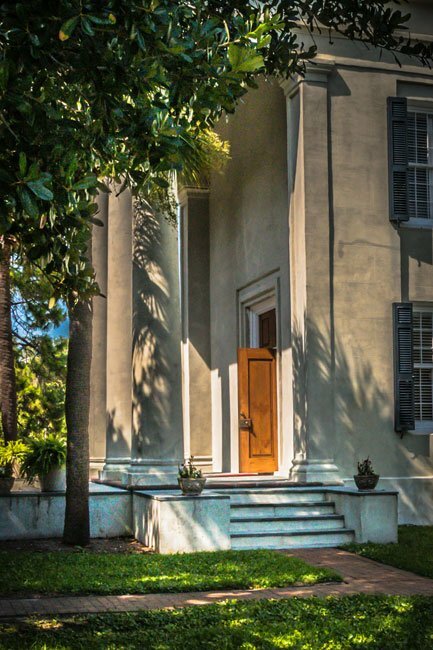 The antebellum architecture, unlike that of Charleston and Savannah, is generally made up of free standing Federal, Early Classical Revival, and Greek Revival style houses on large lots that is more akin to the architecture of the Southern plantations of the period, plantations brought to town and adapted to the heat of the summer weather and dampness of lowlands, as well as to the aesthetics of their waterfront settings. The town’s present appearance owes much to the events of the period between ca.1860 and ca. 1935. The buildings and structures constructed during this period display a variety of architectural forms and styles, including Italianate, Gothic Revival, Victorian, Queen Anne, and Neo-Classical, and reflect the development of the town in the last half of the nineteenth century and early twentieth century. In the 1870s, more modest houses were built on vacant lots in the older parts of town. One type was a five bay I-house, similar in form to many of the antebellum mansions, but reduced in size and of balloon construction using sawn lumber. The second type was a three-bay, gable fronted house, often with Italianate or Eastlake detail. Many antebellum homes were also updated during this period with commercially milled porch details, bay windows, and larger window glass. Colonial Revival made an impact on residential building after the hurricane of 1893, and the bungalow dominated new construction before and after World War I. Commercial construction also reflected increasing prosperity. What an excellent write up!